The lemur and I flew to New York yesterday. We are going to see Die Frau ohne Schatten at the Met tomorrow. Anyway, following the train ride from Newark to Penn station and then the subway to our hotel, this was the first thing we saw after regaining the upper airs. Appropriate or what. This entry was posted in Uncategorized and tagged verdi by operaramblings. Bookmark the permalink. 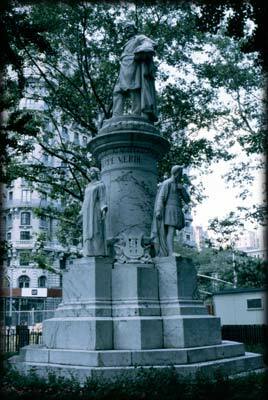 I seem to remember Opera Obsession writing a nice post about this Verdi monument a while ago. What, no review of Frau ohne Schatten yet? No wifi this morning. Will do tomorrow.